Product #20982 | SKU ESASMS124M | 0.0 (no ratings yet) Thanks for your rating! Samson’s SMS124M Mixer Stand Holder is the ideal accessory for Samson’s MixPad® MXP124 and MXP124FX mixers. Perfect for use with Samson’s compact MixPad® MXP mixers, the SMS124M canbe used with a variety of mixing consoles. 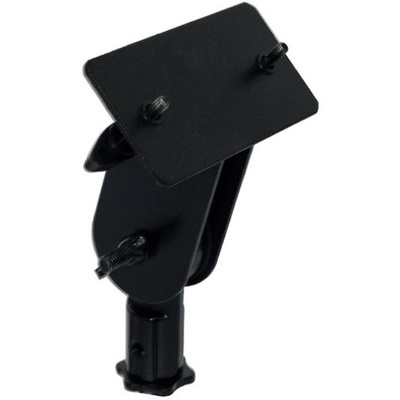 The adapter attaches to your mixer and mounts to almost any standard microphone stand. It’s capable of both vertical adjustments and 360° rotation, enabling ideal placement for your mixer during performances and rehearsals. And with solid metal construction, the SMS124M is built to withstand heavy and constant use. Samson’s SMS124M Mixer Stand Holder provides exceptional convenience to performers and sound engineers everywhere, allowing for audio level adjustments to be made without interrupting ongoing performances.